Each hole presents a unique challenge to any golfer. Holes 4 and 10 present landscapes even the best golfers will have to think twice about while less advanced golfers will appreciate the break that it’s five par 3’s with stunning views will offer. Found 15 minutes from Sydney, off Route 4, the The Lakes at Ben Eoin is an ideal place to host business events, parties, luncheons, and getaways. The conference room gives way to a scenic view of the ski hill and golf course and it’s restaurant boasts a delicious menu for all tastes. This quiet getaway will let you take in the natural scenery of the Nova Scotian country side while provide the ultimate luxury experience. Need a break from the greens? Make sure to stop by the halfway shack at hole nine and enjoy a bite to eat or a cold beverage. This little resto stop is perfect distraction from a that bad three put, give yourself a chance to refocus! 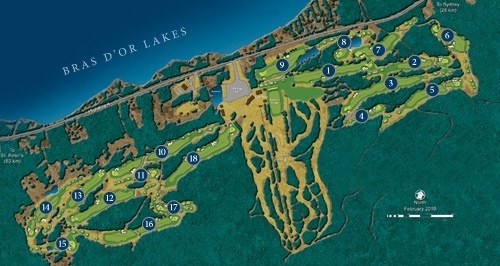 The Lakes at Ben Eoin has made booking tee times incredibly easy and modern with Chronogolf. Easily book tee times directly on their website on your personal computer or phone, you even see which tee times and available and which ones are not. Not to mention that the www.chronogolf.com marketplace offers tee times at Ben Eoin for 35% off, Chronogolf offers weekly deals that can be easily booked through the web. Don’t miss your chance to get a good discount at an amazing golf course, book now!